BIKINI BODY MOMMY™ — New Year, New YOU … BIKINI BODY MOMMY GIFT CERTIFICATE! 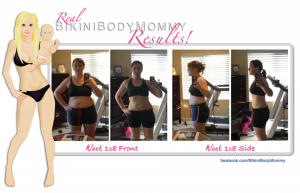 New Year, New YOU … BIKINI BODY MOMMY GIFT CERTIFICATE! It's NOT TOO LATE to let your loved one know you love and support her desire to transform her body and feel better about herself, and that you want her to have all of the tools, motivation, and accountability along the way! THE SKINNY:North America, Sweden, Italy, the UK, South Africa, Australia, Malaysia, Iran, Holland, Ukraine, Saudi Arabia… Regardless of where you are in the world… My online coaching program is designed to be exactly the same experience as if you actually hired me as your personal trainer/nutrition coach to work with you one-on-one -- except everything is done virtually! WHAT TO EXPECT: Each week we will meet 1-on-1 via phone or Skype to map out a PLAN OF ACTION that encompasses specific MINDSET • EXERCISE • and NUTRITION activities. During our weekly session, a daily action plan is designed that encompasses all THREE AREAS to help you hit your personal goal/target by the end of each week, and a weekly Meal Plan is provided. The meal plan is CUSTOMIZED and modified to support your specific needs/goals (i.e. food allergies, intolerance's, life-style choices, breast-feeding concerns, etc.). For built-in accountability between our phone call/skype sessions, adherence to the plan is monitored via an email check-in process every night! THE COST: is $150 for 4-Weeks of 1-on-1 Coaching. • You can start the coaching whenever you are ready. • the 4 week period of time doesn't begin until we have our first session. • There is NO CONTRACT, or commitment beyond the initial 4 weeks of coaching -- whether or not you decide to stop, or continue working with me is totally up to you! HOW TO REGISTER: Once received, your payment will secure a spot in my coaching program (spots are LIMITED) and the receipt will be delivered automatically to your inbox in the form of THIS BEAUTIFUL GIFT CERTIFICATE -- which can be gifted/shared with a long distance loved one via email, or printed to be given in person! TO REDEEM: your loved one simply needs to email the address listed on the bottom gift certificate when she is ready to get started and I will respond within 24 hours to set up her first session! THE FINE PRINT: Gift Certificates are not refundable (medical exceptions given) and may not be redeemed for cash. Expires 1 year from purchase date. STILL HAVE QUESTIONS? Don't hesitate to email info@BikiniBodyMommy.com for the answers! DON'T WAIT -- This IS the LAST OPPORTUNITY your loved one will have to work with me 1-on-1, as I will not be taking on any more NEW CLIENTS after the start of the New Year! ATTENTION "LOVED ONE": Let me Help YOU! After having 3 KIDS and losing 100 Pounds in under a year, no one knows or understands BETTER THAN ME -- the challenges, frustrations, and feelings of down-right DESPAIR that surround TRANSFORMING YOUR BODY on your own! Let me give you the blueprint that will get you the RESULTS you are looking for!!! The New Year is Right Around the Corner … it's time to turn the page -- Let's DO IT TOGETHER! Older PostTHE WORLD is Your G-DAMN OYSTER!